Preheat the oven to 200°C/390°F. Heat the spinach in a pot. In the meantime, finely chop the mozzarella. If the spinach is very watery, drain in a sieve. Add eggs and mozzarella to the spinach, then mix well to combine. Spread the mixture on a baking sheet lined with parchment paper and bake at 200°C/390°F for approx. 15 min. Take another sheet of parchment paper to carefully turn the spinach layer upside down. Gently peel off the first sheet of parchment paper. Bake again for approx. 10 min. 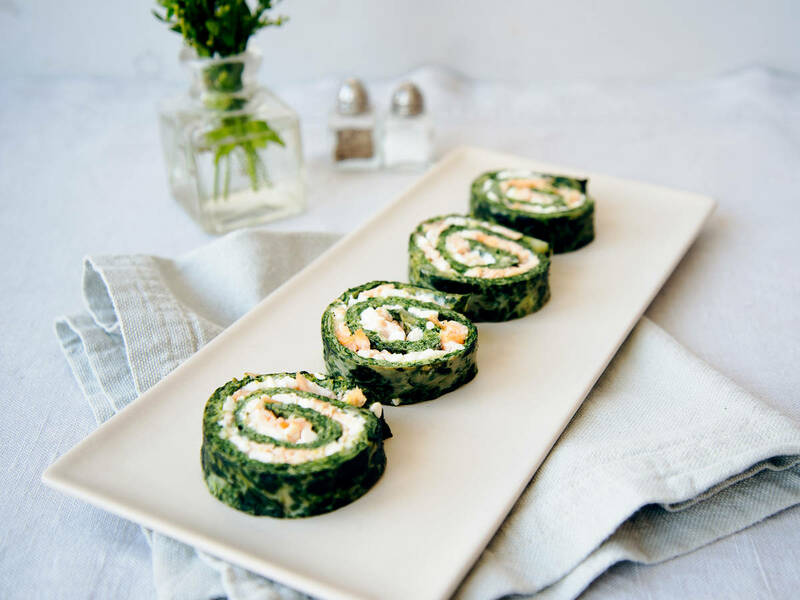 Spread the cottage cheese on top of the spinach layer and add an even layer of smoked salmon. Roll up gently into a log.